Cut the tofu into 1x1" cubes then toss the tofu in the cornstarch and shake off the excess. Fry in hot oil. When it is golden all over and has a thin crush remove it from the hot oil and leave it aside on a paper towel. This classic coleslaw recipe from the CopyKat.com's book allows us to recreate the coleslaw sold at KFC. I chose to make this Goan fish curry recipe from the Seafood book, using the red snapper as the book suggests. I knew the ingredients in the recipe would give a flavour that we enjoy because it is similar to my king fish curry. I adjusted the recipe a little bit to make half the amount. Put the tamarind pulp in about 1/2 cup water and discard the tamarind. Dry roast the coriander seeds, cumin seeds in a saucepan, stir over medium heat until they begin to pop. Remove and cool then put the seeds, dried chillies, garlic, ginger, turmeric, and salt into a food processor. Process until well chopped then add 2 to 3 tbsp of coconut milk and pulse to blend. Heat the oil and saute the onion and cook over low heat. Then add the tomatoes, green chilles and spice paste and cook over medium heat for 2 to 3 until aromatic. Add the coconut milk then bring to a boil and simmer for about 5 minutes. Add the tamarind water then place the snapper into the sauce. Cook the fish for a few minutes until the fish is cooked. This beautifully illustrated Seafood cookbook shows us how to prepare different types of seafood with over 300 wonderful recipes inspired by different cuisines. The book explains about different types of fish. These types of wonderful DK books are 30% off for a limited time. 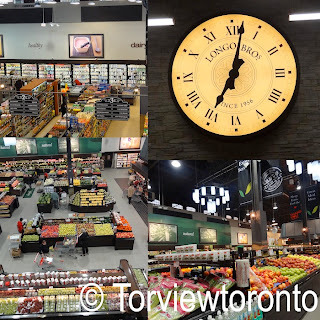 I had a lovely time touring the Leaside Longo's store. 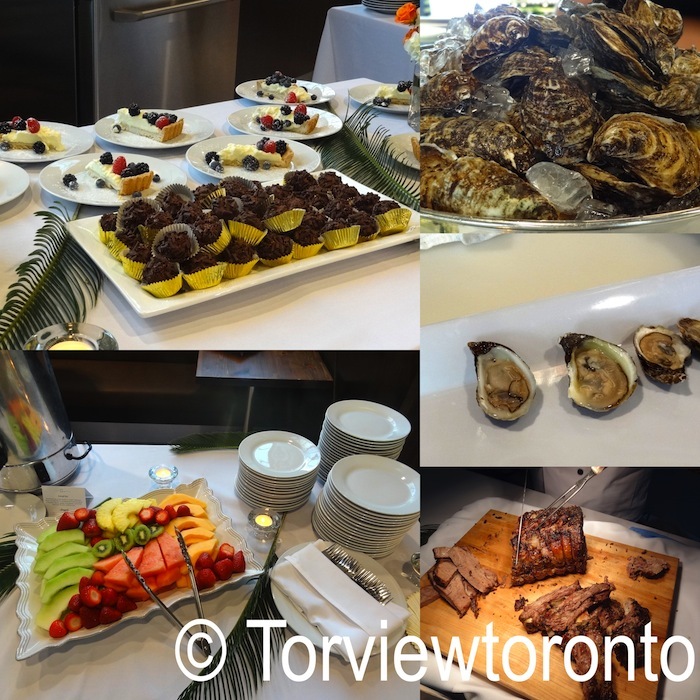 We had the opportunity to meet Longo's food experts and enjoy an array of freshly prepared food at the event. I enjoyed the fresh delicious oysters that were shucked and served. 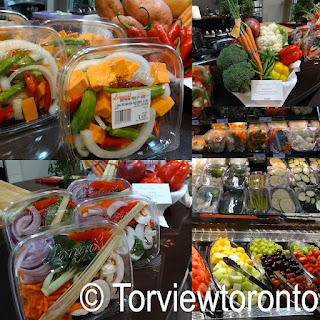 I like the Veggie Bar at Longo's, which has freshly chopped fruits and vegetables that are cleaned and pre cut. We can use these freshly cut produce to make healthy meals at home without cleaning, cutting or chopping. This type of service is convenient for busy families and helps small families to prepare fresh meals at home. 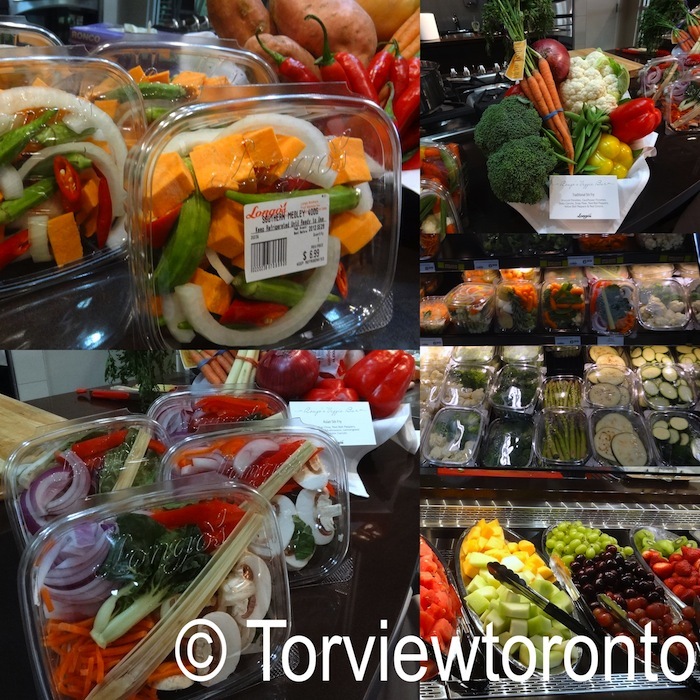 It also promotes eating healthy and including a variety of colourful fruits/vegetables in our meals. It is good to know the freshly cut vegetables are replaced everyday and nothing is wasted because the unsold items are used for the products that are made in the store i.e pizza, sandwich etc. 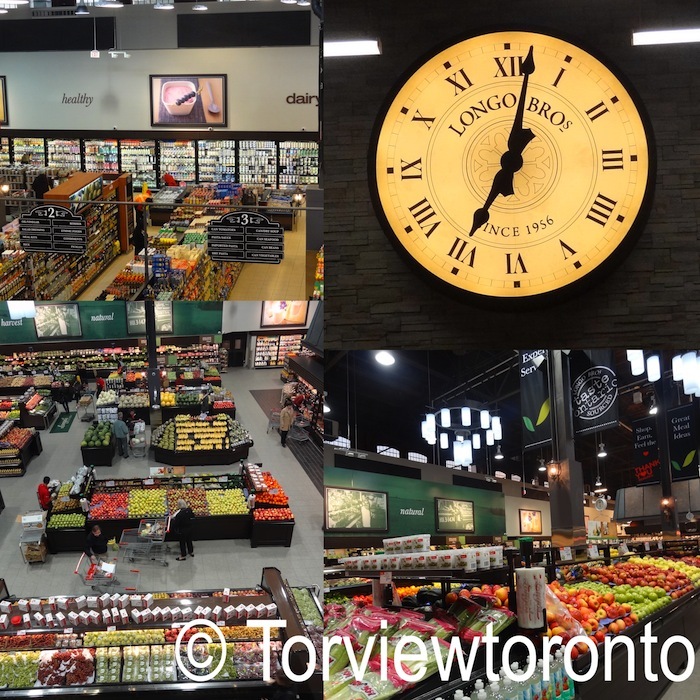 Longo's is a family owned business that puts quality and customers first. 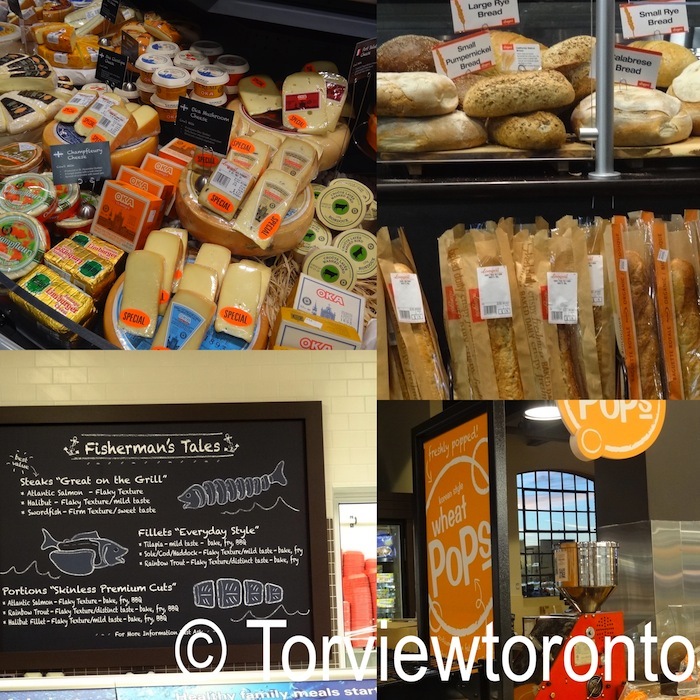 There wasn't fresh halal products at this location, however they had packeted products available. 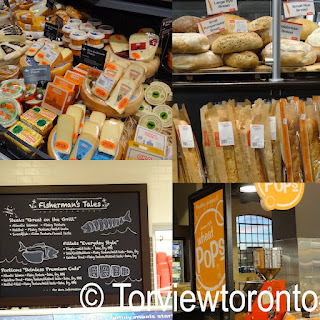 The cheese section had over 300 different types of cheese, that looked really delicious. 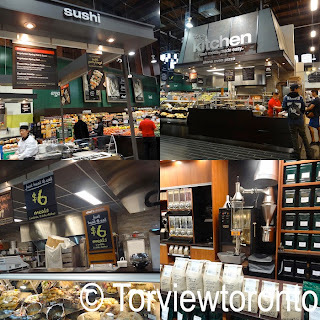 They have a fresh juice bar, sushi, pizza, under $10 meals, fresh baked breads, pops and many more. 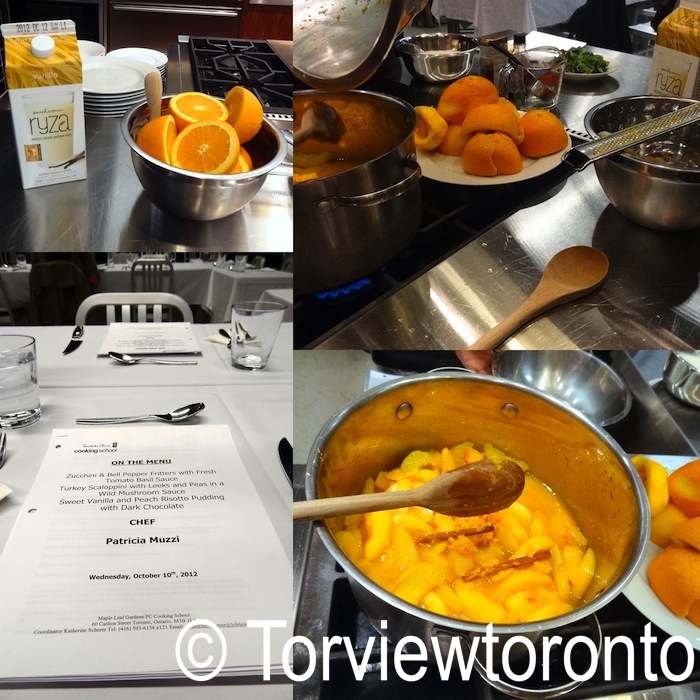 Longo's at Leaside will also be having cooking classes for adults and children in their loft. I liked the atmosphere and the design of the 1919 brick building that had a market feel. This Leaside building once belonged to the Canadian Northern Railway and was designed to service steam locomotives. I made these delicious Jalapeño poppers with the Jalapeño from our garden and quinoa from Longo's. This recipe is adapted from 500 Best Quinoa Recipes by Camilla Saulsbury © 2012 Robert Rose Inc.www.robertrose.ca Reprinted with permission. **any type cooked I used the multicoloured quinoa. 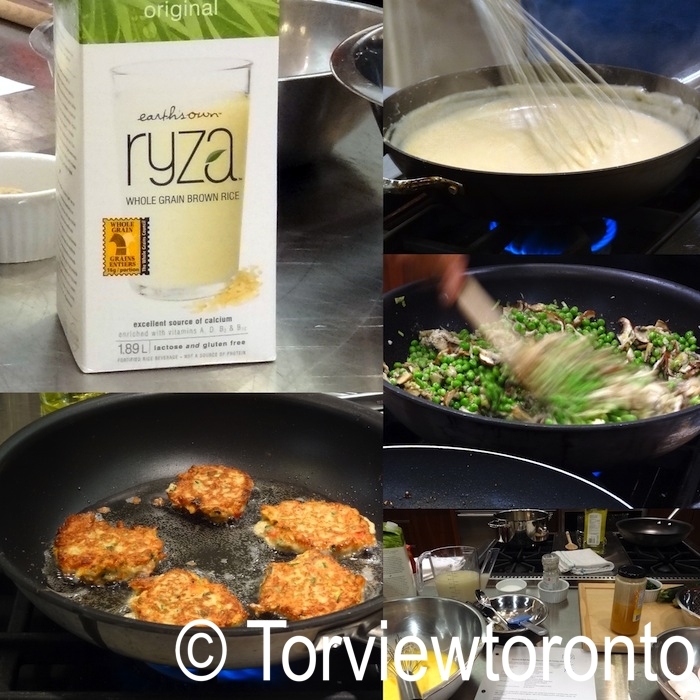 Rinse the quinoa before using by placing it in a mesh and rinse under water. 1 part quinoa with 2 parts of water bring to a boil then cover and cook in low heat for about 12 to 15 minutes until the water is absorbed. Remove the ribs of the jalapeño if you want to make it less spicy and wash it with cold water before putting the stuffing. Mix the cheeses, quinoa, salt and pepper then stuff about 1 tbsp of the mixture into the halves of the jalapeño. Bake for about 9 to 12 minutes in a 450F until the cheese is browned and bubbling. Serve hot. 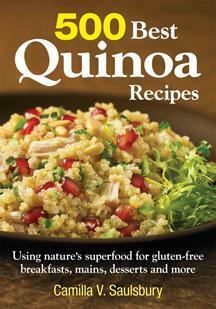 This book 500 Best Quinoa Recipes has 100% gluten free easy to make superfood. The book explains all about quinoa then separates it by breakfast, appetizers, snacks, soups, stews, chills, salads, sides, vegetarian, main dish, seafood, poultry, lean meat, main dishes, breads and desserts. This book also has information about other ingredients that are used in the recipes. Although quinoa (keen wah) is a seed, it is cooked and eaten like a grain. It is harvested from a broadleaf plant that belongs to goosefoot family related to spinach, beets and chard. The plant grows upwards about 7 feet. When the seed head is dry, the quinoa is shaken out. The seeds are coated in saponin, which is a bitter resin like substance that protects the plant from insects and birds. Rinsing the quinoa before cooking helps get rid of the saponin. Quinoa has protein, carbohydrate, dietary fiber, vitamins, minerals, thiamine, riboflavin, vitamin B6, folate, magnesium, vitamin E, iron, calcium, phosphorus and zinc. 1 cup of cooked quinoa has 30% of daily food requirement. It can be toasted like nuts, sprouted, steamed, baked or cooked. We can grind the seeds to make quinoa flour to add into baked goods. It is better to store the flour in the fridge or freeze to keep it fresh. Topped with chocolate glaze or simply rolled in cinnamon, fresh homemade donuts are irresistible. Donuts are lots of fun and easy to make at home. It doesn't matter if it is the fluffy yeast style or denser cake variety of donuts that we prefer because this book 150 best donut recipes has a wide selection that we can choose from to make gourmet style donuts. The book explains in detail about the equipment, common ingredients etc. The type of ingredients we choose to make our donuts is quite important as it makes all the difference in making good donuts. 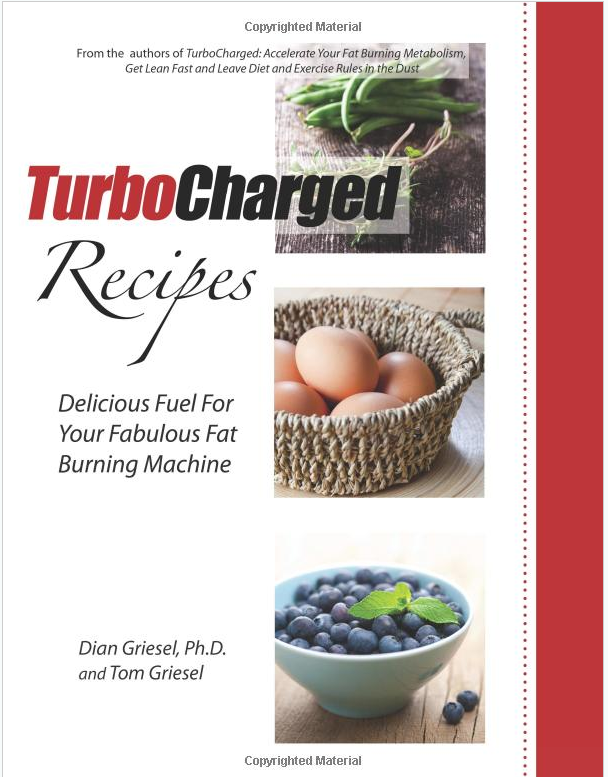 The author explains why it is important to use the correct ingredients such as 1 large egg equals 1/4 cup in volume; it is best to use cream that is 35% whipping cream; store brand butter has added moisture so use brand name butter instead. All the steps in the book are detailed. There is a section in the beginning of the book with pictures to show us how to make the variety of donuts i.e. raised, cake-based, baked, filled, fritters, one bite, bow ties and twists. The book is separated by the types of donuts and has lots of recipes for each of these different types. The end of the book has delicious icings, glazes and sugars that can be used to create an array of delicious possibilities. Here is a recipe to make dozen Apple spice donuts. * To make cake flour at home: for every 1 cup of all purpose flour I took 2 tbsp of flour away and replaced with 2 tbsp cornstarch. Whisk flour, sugar, baking powder, cinnamon, nutmeg and salt. In another bowl whisk eggs, milk, oil and vanilla. Add this wet mixture to the flour mixture with a rubber spatula until incorporated. Fold in the apples. Put the batter into a resealable or pastry bag. It is easier to make the bag sit in a tall glass. Squeeze the batter to one corner of the bag then cut off the corner about 2 cm wide. Pipe the batter into the sprayed donut pan and fill about 2/3 with batter so there is enough room for the donuts to rise when it is baking. Bake in a 325 preheated oven for 10 to 14 minutes. Let the donuts cool in the pan on a rack for 5 minutes then turn out onto the rack and cool completely before icing or filling. Salmon burgers recipe from the book TurboCharged recipes. Combine everything except oil. The book suggests to form 4" patties, however I made 10 mini patties as I served it with small buns. Chill the formed patties for about 2 hours or more. Heat oil in a nonstick skillet over medium high heat. Cook patties until it is cooked through. The book suggests 3 minutes per side, however I cooked for a little bit more. Serve with buns with the topping you prefer. Most recipes use only a few ingredients. All the recipes in the book are easy to follow and understand, as the instructions are simple. We have to figure out about certain methods and change the cooking time to our preference. The beginning of the book talks about healthy eating, answers a lot of questions we all have i.e. should we go organic, getting kids to east healthy etc... The book goes into brief detail about benefits of different vegetable, herbs and spices. I liked suggestions on how to use a variety of herbs, which is good if we are looking to add new flavour into our daily food i.e. quick fried single sage leaves adds a delicious flavour to cheese. The book is separated into sections such as i.e. beverages, dips and dressings, appetizers, soups stews salads, vegetarian, eggs, fish, meats, pulpy and desserts. This makes it is easy for us to find something we want to make quickly. If the eggs aren't organic we should skip them. Organic eggs have 1:1 ratio of omega 3 and 6 fatty acids. Commercial eggs have 19 times more omega 6 than omega 3, which is unhealthy. The book gives a list of produce that we don't have to worry if it is organic or not. It is important for us to read food labels. Did you know if the ingredients are listed as one of the first ingredients then that is the main one? The book has a list of other names that sugar is presented on labels that we maybe unaware of i.e. agave, brown rice syrup, cane syrup, cornstarch, corn syrup, dextrose, fructose, lactose, sorghum, rock sugar, pulled sugar, treacle etc. Store bought dressings have lots of additives. It is better to keep separate cutting boards. We can keep our cutting boards sanitized by washing with 1 tsp chlorine bleach mixed with 1 quart of water. Dip and dry. To quickly bake potatoes boil first for about 10 to 15 minutes then bake or grill. Steam cook with minimal oil and water. Check out more about health on their site. This book is available online and amazon. Giveaway: If you would like to win this book please leave a comment on this post. The giveaway ends on August 25th open to people in Canada and US. 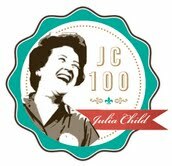 Many of you may know about the JC100 event that started in May where bloggers participated by making specially chosen recipes from Julia Child. 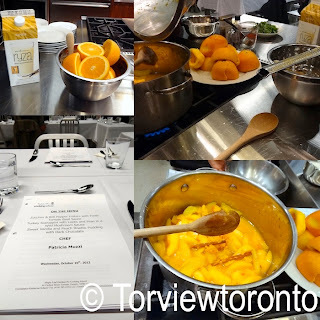 I participated in the 2nd week of the event by making chocolate mousse. Giveaway: To celebrate the 100th birthday of Julia Child on August 15, 2012 I am hosting a giveaway for someone in Toronto (due to postage) to win a copy of this Dearie: The remarkable life of Julia Child a biography by Bob Spitz. Please leave a comment on this post or email me before August 25th if you would like to win this book.